Looking for a Used MX-5 Miata in your area? CarGurus has 4,163 nationwide MX-5 Miata listings starting at $2,495. Delivering both thrills and therapy, a Mazda MX-5 Miata does a body good. Representing the point at which value, performance, engineering, and design intersect on the sports-car continuum, the redesigned 2016 Mazda MX-5 Miata is more than a perfect example of why driving still matters. 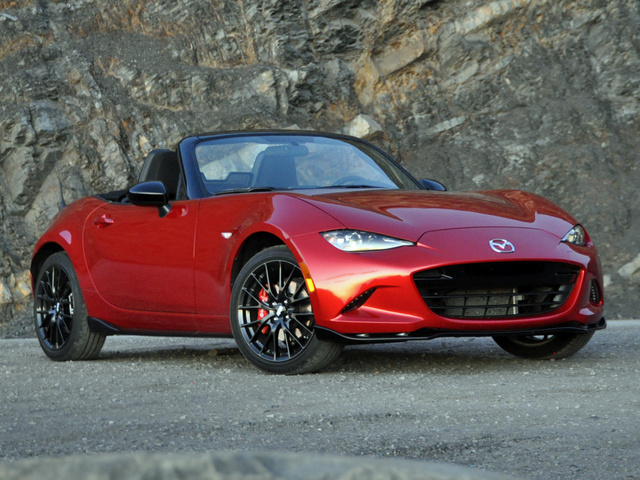 As it has for decades, the new Miata demonstrates that it is not necessary to spend a large amount of money in order to own one of the world’s great automobiles. 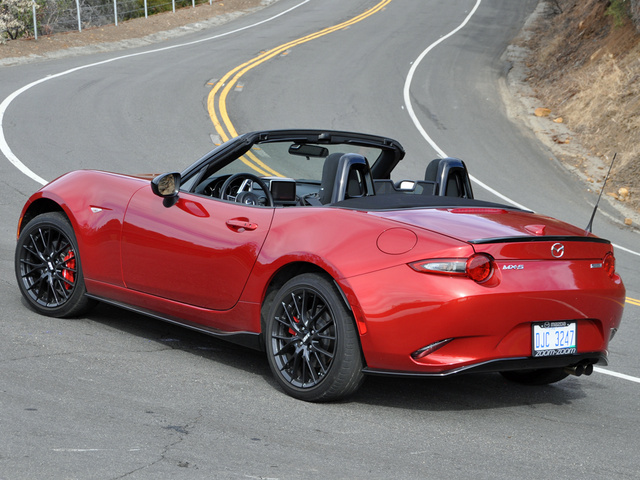 The new Miata isn’t flawless, but once the top is down and you’re rowing through the gears, you’re unlikely to care. Get behind the wheel of a great sports car like the redesigned 2016 Mazda MX-5 Miata, open the top, shift into first gear, release the clutch, and everything is right with the world. It doesn’t matter what’s happening at work, or what’s happening at home, or what’s happened in the past, or what’s going to happen in the future. In the new 2016 Miata, and especially if the road ahead is wide open and writhing across a mountain range, it’s just you, a revving engine, a sweet gearbox, the wind tousling your hair, and uninterrupted focus on the task at hand: driving. Delivering both thrills and therapy, a Mazda Miata does a body good. Obviously, I enjoyed my week behind the wheel of this Soul Red MX-5 Miata Club, the sportiest version of Mazda’s new roadster (even if the standard model is called the Sport). Prices start at $25,735 for the base MX-5 Miata Sport and rise to $30,885 for the leather-lined Grand Touring trim. The Club model is priced from $29,420, and when optioned with every extra it costs $34,720, making it the most expensive version of the new Miata. When you buy the MX-5 Miata Club, you get LED running lights, a Mazda Connect infotainment system, a Bose premium audio system with headrest speakers, black cloth seats with red accent stitching, a front air dam, a rear lip spoiler, and gloss black seat back bar trim. More importantly, this version of the Miata sits on larger 17-inch aluminum wheels with a dark gunmetal finish and a sport-tuned suspension with Bilstein shocks, and benefits from a limited-slip rear differential, a shock tower brace, and an induction sound enhancement system. An automatic transmission with paddle shifters is an option, but then you lose the Club model’s critical suspension and axle upgrades, so forget it. Plus, Club models with an automatic can’t be fitted with the optional Brembo brakes and BBS lightweight forged aluminum wheels seen on my test car. This option runs $3,400, and since I’ve never driven a 2016 Miata without this upgrade, I can’t say how they improve the car’s performance. Given how addicting the new Miata is to drive hard and fast, though, I’d say to any car enthusiast that this option represents money well spent. Unfortunately, when you get the wheel and brake upgrade, you’re forced to buy an Appearance Package with gloss black side sills and rear bumper skirts. Meh. Add a keyless entry system, a black rear spoiler, and the extra-cost Soul Red paint into the equation, and my test car’s price tag rose to a staggering $34,400. If that sounds expensive, consider this: A new Porsche Boxster costs more than $53,000 before adding a single option. And it seems like everything is optional on a Porsche. Soul Red is Mazda’s current signature paint color, and it looks terrific on the Miata, virtually glowing in the twilight after the sun dips below the horizon. The more time I spent with this car—driving it, photographing it, washing it—the more the styling grew on me. From the angry, angular headlights to the round, inset tail lamps, the new Miata’s flowing design demonstrates drama, thoughtfulness, and cohesiveness. It is clearly an improvement over the previous Miata, and because it’s not necessarily trying to look like a Miata, the design should age well. Looking ahead through the windshield heightens the sensation of speed. The swollen front fenders focus the driver’s eyes on the road, and the body-color upper door panel trim pieces visually extend the bodywork into the cabin, making occupants feel like an integral part of the motoring experience. Minimalism rules inside the Miata, despite the inclusion of new technologies with this redesign, and it takes nothing more than a glance at the large and simple instrumentation to check engine revs, vehicle speed, fuel level, and current transmission gear. Black is the dominant interior color choice, but a couple of the paint colors offered for the Grand Touring models are available in combination with Sport Tan leather. Honestly, I’m not sure why Mazda even bothers. Given the new Miata’s 155-horsepower 2.0-liter 4-cylinder engine, and the fact that peak power is made at 6,000 rpm while the maximum 148 lb-ft of torque is available at 4,800 rpm, I thought for sure that I was going to write all about how this car needs a turbocharger. That’s what happens when a car weighs just 2,332 pounds. It doesn’t take much in the way of motive force to make it go, and fast. The Miata feels that way, anyway, and the Club’s limited-slip rear differential really makes best use of the power when accelerating around a corner or out of a turn. Available only with the car’s standard 6-speed, short-throw manual gearbox, the limited-slip rear differential regularly contributes to making the Miata Club fantastic to drive, slinging the roadster out of corner after corner. If you opt for the 6-speed automatic, which has paddle shifters, you’ll lose the upgraded rear diff. You can’t install Brembo brakes or BBS forged aluminum wheels on a Club with an automatic, either. Given my test car’s brilliant driving dynamics, they’re worth the extra cost if you plan to spend lots of time on the types of roads this vehicle was made to devour. 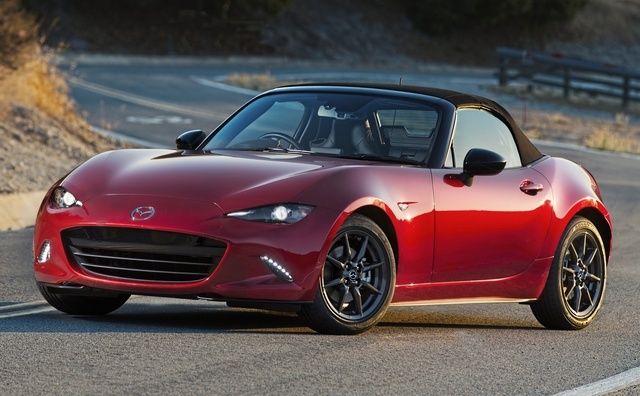 Smaller and lighter than the previous Miata, the new 2016 version also boasts a lower center of gravity. 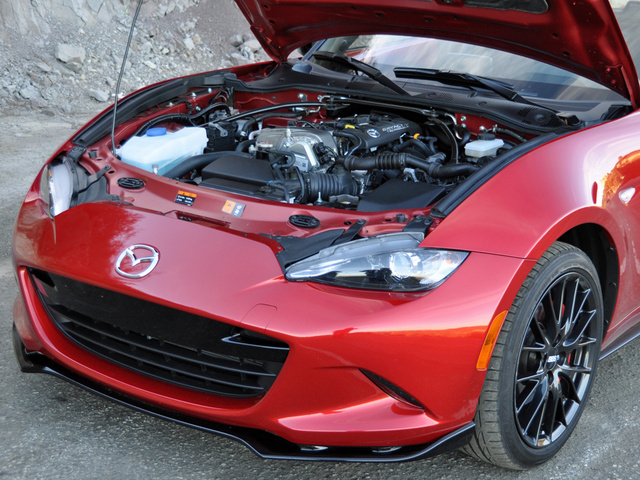 Mazda mounts the engine behind the front axle line, giving the Miata a front-midship powertrain layout for improved weight distribution and balance. With a driver aboard, 53 percent of the car’s mass sits on the front wheels, and 47 percent is centered on the rear wheels. To make sure I would conduct a proper evaluation, I took a day away from my desk and drove just about every single ribbon of road laced atop the Santa Monica Mountains northwest of downtown Los Angeles. From maneuvering around the crowded parking lot at the Trancas Starbucks to whipping along the single-lane Cotharin Road, the new Miata proved enormously gratifying to drive. Although it's equipped with a sport suspension and 45-series tires, the Miata Club doesn’t beat its driver and passenger up with a stiff, rough ride. The degree of compliance is impressive given the car’s astounding grip in corners. Diminutive dimensions allow a Miata to really rip down a mountain road, too, using as much of the lane as possible to help maintain forward momentum. Although it was chilly during my early December testing day, the Brembo brakes religiously delivered instantaneous response and fade-free performance. Remarkably, and despite the thrashing I administered to the car, it averaged 28.3 mpg. That’s short of the EPA’s rating of 30 mpg in combined driving, but I’m pretty sure the EPA’s test cycle doesn’t include regular runs to redline or elevation changes measuring in the thousands of feet. If there is an unexpected or disappointing aspect of the Miata’s driving dynamics, it pertains to the electric steering. Don’t get me wrong; as electric steering systems go, this one is impressive. But it exhibits a subtle on-center disconnectedness that is most evident when driving on the freeway at higher speeds and trying to dial in very small steering corrections. Under all other driving circumstances, the steering is just as enjoyable to use as the rest of the car. My observations about the new Miata’s steering are rooted in comparison to my own Miata, a 2004 Mazdaspeed MX-5 that I bought new. When it comes to several aspects of the new Miata’s interior, I find it inferior to my old car. For starters, it is harder to get into and out of the new Miata. The doorsills are taller, the door opening itself seems a little smaller, and the relationship of the seat to the door opening makes possession of stomach muscles and healthy knees even more important in the 2016 model. My car also has stainless steel doorsill covers, while the new Miata’s are black plastic and very easy to scratch. When I drive on twisting mountain roads, I shuffle steer. 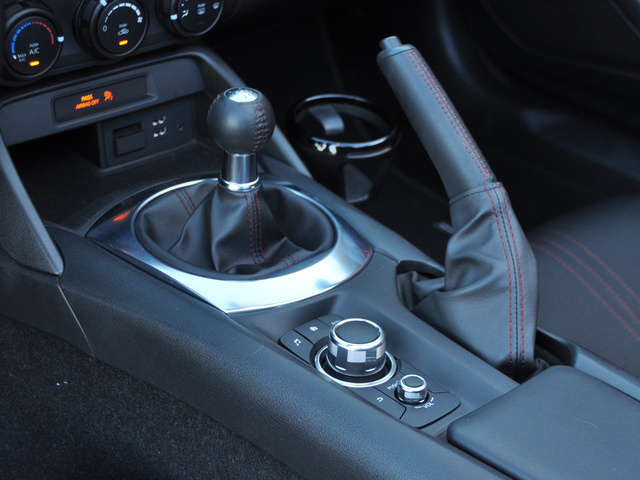 In the new Miata, my right elbow bangs into the center console, whereas that isn’t a problem in my old Miata. Certainly, the new car’s lower seating position, combined with seats that the driver sits in rather than on, contribute to this problem. Driven back-to-back, I also prefer the slightly higher and more “open” seating position of my old Miata, which heightens the sensation of speed through greater exposure to the environment. In the new car, the driver is tucked down into the cockpit. That’s not necessarily a bad thing, but it does make the new Miata feel more like other 2-seat roadsters rather than unique. It didn’t take long for me to decide that I didn’t enjoy the new Miata’s ball-type shifter knob as much as the bullet-style shifter in my Mazdaspeed. Finally, and this amounts to my biggest complaint about the new Miata, after tackling curve upon curve, my left leg hurt just below the knee from bracing my leg on the door panel, a problem that does not occur in my own car. The plastic pod housing the power mirror and window controls really ought to be padded. 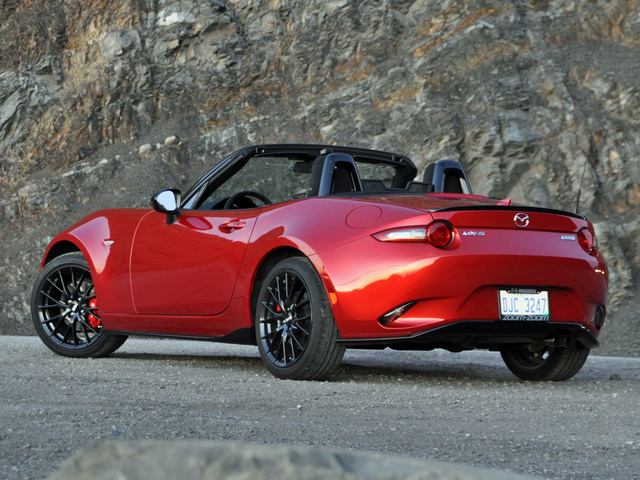 Otherwise, this new Miata is easy to love. The seats are outstanding in terms of comfort and support, and the manual thigh adjustment for the driver’s seat is much appreciated. As I expected, the new Miata is a snug fit, especially for a guy my size (6 feet, 250 pounds), but it doesn’t feel small or uncomfortable, making it easy to put in several hours of driving at a time. Plus, it has cruise control, something my Mazdaspeed lacks. Mazda still makes one of the best convertible tops in the business. It’s got a single latch design, is light and easy to use with one hand and from the driver’s seat, and locks into place behind the front seats for a smooth appearance and without infringing upon trunk space. Raising the top is just as easy. 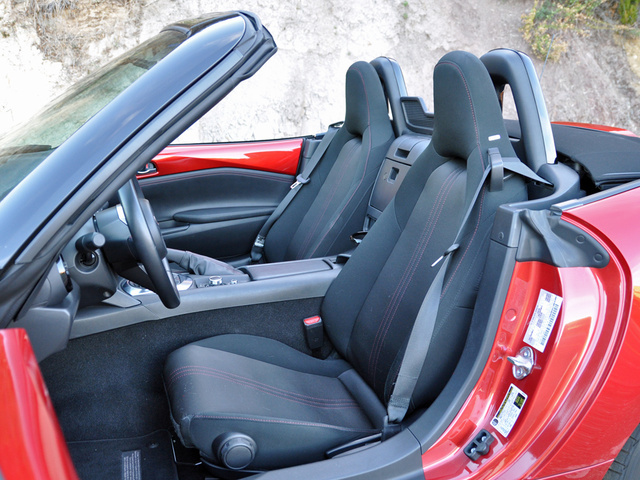 Unless it’s raining or snowing, you’re likely to want to drive with the top down. I’m happy to report that on a cold morning with canyon temperatures dipping into the mid-30s, I was, for the most part, warm and toasty while driving at 60 mph. Wearing nothing more than a T-shirt, a sweatshirt, and jeans, and driving with the windows up and the heater blasting, the Miata was easily bearable at such low temperatures. Contributing factors supporting this assertion include a cabin largely free of wind buffeting and air drafts, and dashboard air vents located on either side of the steering wheel that warm the driver’s hands when they’re in a proper 10-and-2 or 9-and-3 position on the steering wheel. All I needed that day in order to stay perfectly comfortable was a knit beanie. Whether the Miata’s top is up or down, the trunk holds 4.6 cubic feet of cargo. The strut-supported lid opens to reveal a rather small opening and a deep but not wide cargo space, one that is smaller than last year’s Miata and my own car’s shallower but wider 5.1-cubic-foot trunk. A full-size suitcase fits into my car, but not the new Miata, which ought to accommodate a carry-on without trouble. As would be expected, the new Miata is more technologically sophisticated than any Mazda-badged roadster to come before it. Still, rather than ladling technology onto the car like extra gravy over dry turkey at a holiday gathering, Mazda uses it to spice the car, bringing modern flavor to a succulent driving experience. A set of LED headlights is standard, allowing Mazda to minimize the size of the Miata’s headlights, and LED running lights are installed for the Club and Grand Touring models. Inside, Mazda takes a traditional driver-focused approach to the instrumentation and controls, further equipping the Club and Grand Touring models with a Mazda Connect infotainment system and a Bose premium audio system with speakers embedded into the car’s head restraints. 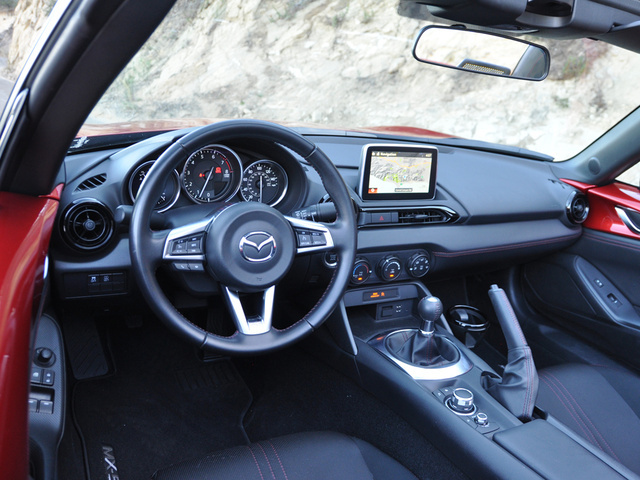 Mazda Connect includes a 7-inch touchscreen display mounted to the dashboard and a set of controls on the center console similar to Audi MMI and BMW iDrive designs. Stereo volume and radio-station pre-set tuning buttons are located on the steering wheel, a good thing since the center Commander Control knob and its surrounding buttons are a bit awkward to use when you have longer arms. Bluetooth connectivity with music-streaming capability is standard for all Miatas, as is a USB port. With Mazda Connect, an additional USB port is installed, and the system supports text messaging while providing access to Internet radio platforms such as Pandora. An E911 automatic emergency-notification system is also included with Mazda Connect, which can get first responders to the scene of an accident even if the driver can’t make the outgoing call. Wisely, Mazda provides a rubber-lined tray designed to hold a smartphone in place, and that’s exactly where my phone rested when my wife called me during my daylong love-fest with the car. I could hear her just fine, because the call was routed through the head-restraint speakers. She, however, reported lots of trouble hearing me. So, then, we have another good reason for driving with the top down as often as possible. You’ll have a great excuse for not taking calls. In designing the new Miata, Mazda wanted a smaller and lighter car, but one with a more robust underlying structure for improved ride, handling, and safety characteristics. From behind the steering wheel, the effort is readily apparent, especially in comparison to my decade-old Miata, which wiggles like overcooked pasta on lousy roads. Chassis flex and cowl shake are barely detectable in the new MX-5 Miata. This more robust architecture certainly must provide better occupant protection in a collision. If and when the new Miata is assessed in crash-test programs, it may well look safe on paper, but there’s no getting around the fact that in certain types of crashes, vehicle weight matters. At 2,332 pounds, the Miata is an ultra lightweight car, and in a fight with a typical SUV, this little roadster is going to lose. Nevertheless, the good news is that Mazda offers new technologies designed to help the Miata’s driver avoid an accident in the first place. The bad news is that they come only on the Grand Touring trim. Choose that version of the car and you’ll get rain-sensing windshield wipers, adaptive headlights, automatic high-beam headlights, a lane-departure warning system, a blind-spot warning system, and a rear cross-traffic alert system. If you’ve got little kids who might want a ride in the Miata, like I do, you should know that this car is not equipped with LATCH anchors. My old Mazdaspeed MX-5 has them, but in the new Miata, the manual instructs child-safety-seat installation using the automatic locking retractor seat belts. Keep thinking of the new Miata as a half-price Porsche Boxster, and it will be easy to justify the purchase in terms of cost effectiveness. Not only is this car affordable in terms of its bang-for-the-buck value, it is also rated as cheap to own and extremely reliable. Speaking from experience, this is absolutely true, though replacing the tires is pricey if you’re selecting the best rubber that will fit the car. Fuel economy takes a big leap forward with the new Miata. Last year, when equipped with a 6-speed manual gearbox, the car was rated to get 21 mpg in the city and 28 on the highway. This year, ratings jump to 27 mpg in the city and 34 on the highway, with an estimate of 30 mpg in combined driving. I got 28.3 while driving the car with enthusiasm and ended the week at an even 30 mpg. Don’t bother looking for deals on the new MX-5 Miata. Aside from a lease for the basic Sport model, one that’s almost double the lease payment on a Honda CR-V that costs more, discounts are hard to come by. That’s because people like me—driving enthusiasts, sports-car aficionados, and Miata geeks—are busy satisfying urges to buy the new Miata. Be patient. After next summer, especially as cold winter weather approaches, Mazda dealers will likely be discounting the new MX-5 Miata. Plus, by then, it will have new competition in the form of the 2017 Fiat 124 Spider, which is based on the Miata but has a distinctive Italian flavor all its own. What's your take on the 2016 Mazda MX-5 Miata? Mazdasucks The rear struts clank metal to metal. The dealer service takes for ever to fix. Have you driven a 2016 Mazda MX-5 Miata? Do The 2016 And 2017 Mx-5 Miata Have Backup Cameras? After only 30,000 kilometers, i need to replace my stock tires on my 2016 MX5 GT. Do I really need to replace them with performance tires? Trying to find out what the electrical box below the hood latch on a Mazda Miata mx5 is for? Mazda Mx5 Or New Fiat 124? How Reliable Is Multi Air Turbo Engine?